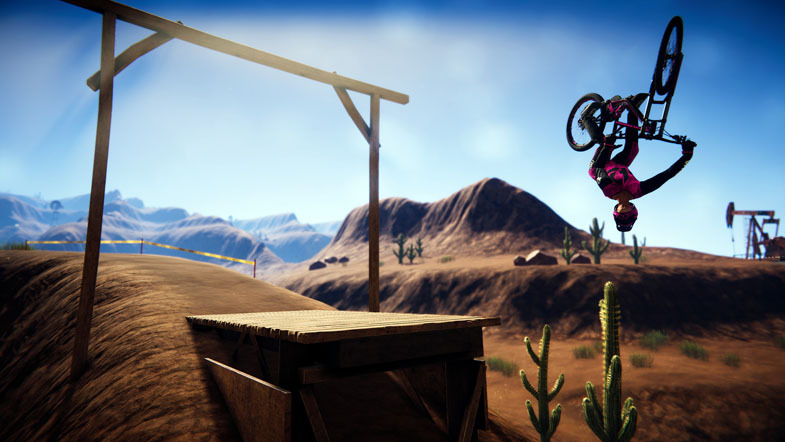 Descenders is a fast-paced cycling title in Early Access, featuring procedurally generated maps and a breadth of cosmetic customization. With various environments to unlock and explore, and beautiful graphics up close, there’s an immersive feel that's likely to get you hooked. The tutorial eases you into basic maneuvers and tricks with extremely brief step-by-step lessons, and you’ll respawn at the beginning if you crash. The physics were much better than I expected; steering and performing tricks felt precise. Likewise with the overall handling, which is both predictable and not too unforgiving, except for when you hit an obstacle or don’t land a large jump properly. In actual ride sessions after the tutorial, you have a health bar of four and a last stand. Harder bails deplete more of your health. Your session ends if you bail during your last stand. You can regain health by completing a bonus objective, but each wipeout diminishes your current rep (reputation) by a set percentage. You might opt to retire a session early if you’re having a bad run and you’re on your last stand, as there’s less of a penalty that way than if you crash. Once you rank up enough, you can sign onto one of three teams. Subsequent rank-ups might unlock other features, depending on how the devs leave things. You can move down in rank if you lose too much rep (it’s possible to have a net loss after a session). Miscalculations and mistakes are costly: attempting a flip with not enough air, botching the placement of a landing, touching a tree, and so on, will wreck your rep.
Each team emphasizes a different playstyle; you can choose stunts (Enemy), off-road terrain (Arboreal), or speed (Kinetic). I chose Kinetic. You get clothing representative of your chosen team and you may obtain other clothing— or even bikes — of varying rarity by attempting regular rides. You need not complete the boss level, and retiring early also won’t prevent you from obtaining these items. I wonder if later there will be stats, such as most-used item, tricks conducted, miles traveled, etc. Once you complete a boss level, you enter into a new area. The hardest aspect of these levels is the final jump. If you don’t get enough air, crash, or if you miss the ramp you’re supposed to land on, you’ll likely botch your landing. After the Highlands is the Forest environment, where if you beat the boss level three times and complete a bonus objective in that level, you unlock a permanent shortcut to the Forest that can bypass the Highlands altogether. The passages here pose more difficulty than the previous environment. Consider some of the hardest levels you rode in the Highlands and add trickier curves and more obstacles — that’s how the Forest feels. If you want to continue to earn rep until you’ve practiced the Forest environment, you might want to repeat the Highlands and keep retiring after the boss level. (Retiring there yields no rep penalty.) To practice for the Forest environment, you may freely roam the main camp area and try out the small roads and ramps surrounding it. You may also practice the Forest without the worry of penalizing your rep for wrecking. You can’t just memorize the layout of a track, because each one is procedurally generated, providing a fresh experience in every session. There’s an exciting Coming Soon tab in the menu that brings up a projected roadmap of additional features. It shows that the devs are actively working on including more random visual modifiers, improving performance, and adding other environments. Other types of bikes and the option to customize level generation are on their Requested list. I find Descenders satisfying already, so these additions will only make gameplay more spectacular. The relaxing music combined with the intensity of a ride doesn’t seem like a combination that melds well, but it does. The mellow soundtrack lets you focus on speeding through a track with calculated technique, while also suggesting just enough risk for when you’re feeling dangerous. I could imagine myself getting too amped if the soundtrack featured songs that matched the tempo of a session, so I’m grateful it’s restrained. Growing up, I hardly played downhill freeriding, instead opting for urban, trick-oriented bike titles (such as Dave Mirra’s BMX for the PS1) which were more open and allowed a degree of exploration. This title’s procedural generation ensures replayability, while the risk-reward calculations you must undertake to guarantee steady increases in rep make this release fun and challenging. It already feels complete, but there’s more to come. If you enjoy this genre, or if you’re looking for a title with a casual feel from time to time, you should get this.